Shipping: Pacific Rim Series 2 Action Figures and 1/4 Scale Battle Damaged Iron Man! You are here: NECAOnline.com » Blog » News And Announcements » Shipping: Pacific Rim Series 2 Action Figures and 1/4 Scale Battle Damaged Iron Man! It’s a battle-ready week, with Series 2 Pacific Rim and a new 1/4 Scale Iron Man headed to retailers! As far as epic battles go, the fights in The Avengers and Pacific Rim rank pretty high on the All-Time Awesome list. So we’re pretty excited that new figures from both — many featuring heavy battle damage — are heading out of our warehouse and toward retailers this week! Check out Battle-Damaged Iron Man and Pacific Rim Series 2 Action Figures! Following the success of our instant sell-out 1/4 scale Iron Man figure comes this brand new Battle-Damaged version of the Mark VII armor. The third offering in our Marvel Avengers line includes a brand new head sculpt featuring the likeness of Robert Downey Jr. as Iron Man. This figure also includes newly damaged armor plates and an incredible paint job showing the weathering detail from the battle for New York City. The figure stands approximately 18″ tall and features over 25 points of articulation, incredible movie accurate detail, and LED lights on the chest and palms. Uses button cell batteries, included. Window box packaging. Fresh off the release of Guillermo del Toro’s epic sci-fi action movie, PACIFIC RIM, comes a second series of 7” deluxe action figures. When an alien attack threatens the Earth’s existence, giant robots piloted by humans are deployed to fight off the menace. 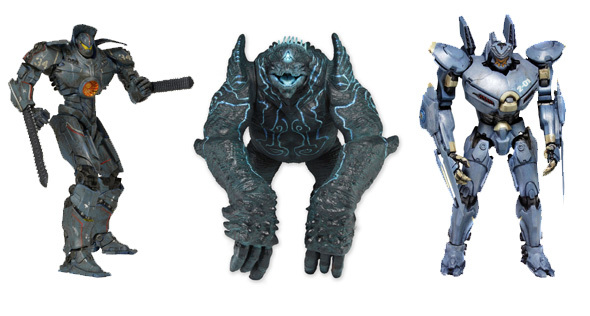 Series 2 includes Battle-Damaged Gipsy Danger, Striker Eureka, and Leatherback. Figures stand roughly 6″ – 8″ tall and are created directly from the digital files used by ILM in the making of the movie.